Toronto, ON., (March 27, 2014) – In its annual survey of Canadians, Reader’s Digest has once again found that Toyota is the one of the country’s most trustworthy passenger car brands. The survey has been conducted for the past six years. Each time, Toyota has emerged as one of the choices for most trusted passenger car manufacturer. Toyota was also named the most trusted hybrid car manufacturer for the fourth consecutive year. For the survey, Reader’s Digest commissioned Ipsos Reid to study who Canadians view as Canada’s most trusted brands in 37 product categories. Approximately 2,500 surveys were completed, providing a representative sample of the Canadian population. Long-term value – Toyota collected more awards in February for the long-term value of its vehicles than any other Canadian manufacturer, with 10 from ALG, seven from Canadian Black Book, and three from Kelley Blue Book. These came a few months after Vincentric named Toyota the Best Value Passenger Car Brand for the second straight time, with 12 specific vehicles notching individual awards. 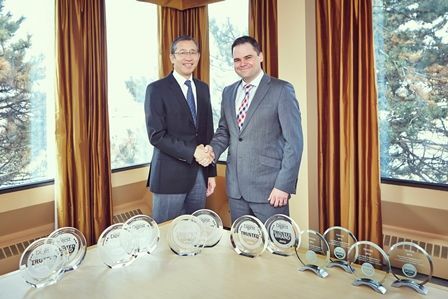 Fuel economy – In February, Natural Resources Canada named six Toyota Canada vehicles as best-in-class for fuel efficiency for the 2014 model year, more than any other automotive manufacturer. Safety – In 2013, Toyota earned 13 Insurance Institute for Highway Safety (IIHS) Top Safety Pick awards, the most of any automotive brand.